Overall branding, publicity and media relations support. 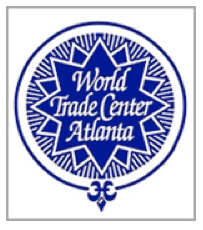 Marketing Challenge: With worldwide reciprocity with World Trade Centers across the globe, the WTCA is a unique Atlanta club that marked its 30th anniversary in November 2012. Unlike most private clubs in the city, it organizes an array of global events and provides opportunities for networking with the international community, but does not offer meal service except during weekday lunchtime or during special events. That provided unique challenges to WTCA's ability to compete with other private clubs with full-service dining facilities as well as prove WTCA's value as a business club with exclusive international networking events and educational symposia hosted and/or sponsored by top Atlanta Metro corporations, including those in the Fortune 500, like UPS as well as area banks. Extensive media outreach for 30th anniversary milestone event. Provided pre and post publicity for “Taste Of” events, which highlight food from many parts of the globe: Italy, Spain, China and Mexico for example. Connected the organization with media representatives. Coordinated photo coverage at events. Organizaed programs such as “Speaking Skills for International Business Success”. Publicized the co-sponsorship of the Governor’s Awards with the Atlanta Business Chronicle. Introduced the board president to media at one-on-one lunches and acted as a liaison as interviews were secured. Secured visibility for programs sponsored by international organizations at the WTCA, such as the Pan-African American Chamber of Commerce. Distributed announcements about election of new board members and other key board activities. Marketing Outcome: During 2012 alone, WTCA received three mentions in the Atlanta Business Chronicle including two with photo coverage. They have achieved a larger role in the Governors Awards program which they sponsor with the Atlanta Business Chronicle each year. The attendance at the 30th anniversary celebration in October 2012 exceeded the board's expectations. Since 2010, the World Trade Center Atlanta has achieved visibility as a viable local entity with national outreach as well as publicity in the Northside Neighbor and on WXIA 11 Alive.